Tableau Server comes with one site named Default. Server administrators can add sites to the server and modify any site’s settings. If you’re adding a site to the server for the first time, select Settings > Add a Site, and then click Add a Site. If you’ve added sites before, in the site menu, click Manage All Sites, and then click New Site. If you're editing an existing site, select it on the Sites page, and then select Edit Settings. Or, in a single-site deployment, click Settings, and then click the General tab. Note The “#/site” portion of the URL (for example, http://localhost/#/site/sales) cannot be changed. In multi-site server environments, these segments appear in the URL for sites other than the Default site. For Storage, select either Server Limit or GB, and enter the number of GB you want as a limit for storage space for published workbooks, extracts, and other data sources . If you set a server limit and the site exceeds it, publishers will be prevented from uploading new content until the site is under the limit again. Server administrators can track where the site is relative to its limit using the Max Storage and Storage Used columns on the Sites page. Select whether only server administrators can add and remove users and change their site roles, or whether you want to allow site administrators to manage users on this site. Server limit: For a server with user-based licensing, the limit is the number of available server seat licenses. For a server with core-based licensing, there is no limit. For more information, see View Server Licenses and Troubleshoot Licensing. <number of> users: Allows a site administrator to add users up to a limit you specify. See Work with Sites for information on licensing and user limits. 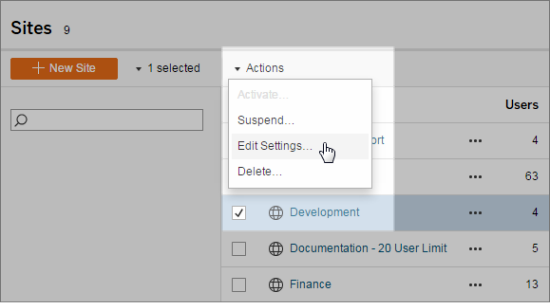 Select Allow users to use web authoring if you want to enable browser-based authoring for site content. When web authoring is disabled, users cannot edit published workbooks from the server web environment. To update a workbook published to the server, a Tableau Desktop user must re-publish it. For more information, see Set a Site’s Web Authoring Access. Enable comments so users can share a conversation about data views, including snapshot images to highlight discoveries. For more information, see Comment on Views in Tableau user Help. Enable data-driven alerts to let users automatically receive emails when data reaches key thresholds. For more information, see Send Data-Driven Alerts in Tableau user Help. Select Allow users to subscribe to workbooks and views to let site users subscribe to views and receive regular emails of them. Select Allow content owners to subscribe other users to workbooks and views to let administrators, project leaders, and content owners set up subscriptions for other users. These options are visible only if you have configured subscription settings. Under Email Settings, you can enter a custom From Address for alerts and subscriptions. While the email address you enter should use valid syntax (such as bizdev@myco.com or noreply@sales), Tableau Server does not require it to correspond to a real email account. (Some SMTP servers may require an actual address, however). If you want a standard email footer to appear, select Custom footer, and enter the text you want to display above Tableau Server links in email messages. Enable offline favorites for Tableau Mobile to let mobile users access cached snapshots of views. To initiate recording, users must add a parameter to the workbook's URL. For more information, see Create a Performance Recording. Note: After you add your first site to Tableau Server, the site menu becomes available. When you select All Sites and click Users, the Server Users page appears, showing all users. When you select a specific site and click Users, the Site Users page appears. To add users to the server or specific sites, see Manage Users and Groups.